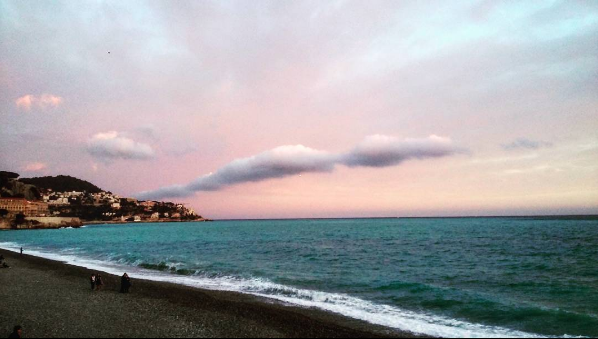 Back in March I treated my Mum to a weekend away in Nice – for Mother’s Day – and have finally decided to write a few words about it (committing to the back catalogues of the internet that I did something generous once). 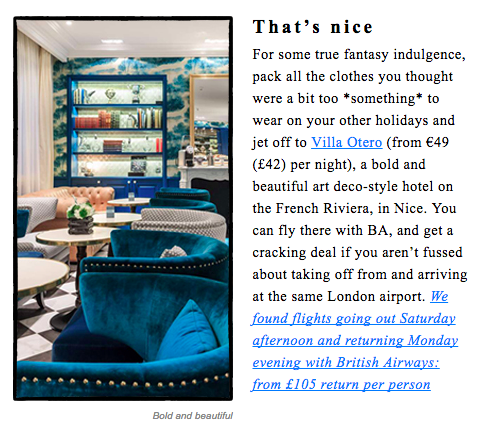 The idea came after reading this Emerald Street newsletter, and quite frankly being seduced by the extraordinary blues and hues of the art deco-esque Villa Otero. Upon discovering that rooms and flights were actually very reasonable (£90 for 2 return flights from London Gatwick with EasyJet), I spontaneously booked the trip and then had a whale of time withholding the secret from Mum. The journey was really smooth. It was one of the first times I just had carry-on luggage and therefore didn’t have to fuss about at baggage claim (also ideal if you’re operating on 2 hours sleep and a hangover – a 7am flight seemed like a good idea at the time – and waiting around just isn’t in your current lexicon). Buses arrive regularly outside the airport and deliver you to the centre of Nice and the train station, near to where our hotel was situated. The hotel itself was a delightful mixture of comfort and extravagance. The lobby slash dining area is strikingly decorated, a mixture between Parisian Jazz Age opulence and the alfresco cool of the riviera. And everything is polished to a reflection-spawning sheen. I was immediately won over by the free Nespresso and WiFi (oh to be an over-caffeinated, Instagram-obsessed millennial), and further enticed by the promise of free pastries and sweets in the afternoons. The rooms are compact but well-equipped, and equally eye-catching in their decor. (The interior designer clearly loves a ‘focus wall’ as much as Anna Ryder Richardson from Changing Rooms, circa 2002). We stayed in the one below. Bonus points for the beds being really comfy, the bathrooms being super clean and modern and the full-length mirror in the hallway area being perfect for taking outfit selfies. Unfortunately on the Saturday we arrived it was pouring with rain (the kind where you think the clouds are detoxing like Victoria Secret’s models or Brides-to-be, in a bid to get rid of their excess water weight), so our plans to stroll to the Museum of Modern & Contemporary Art were scuppered. Nothing a quick nap and some free coffee couldn’t fix however. That evening I had pre-booked a table at La Maison de Marie, an upscale restaurant near the Place Massena. The food and drink were divine. I had gnocchi with pesto and something chocolate-y for dessert. I remember feeling very decadent and satisfied. On Sunday, we kicked off proceedings with a bus tour, which is a convenient way to get yourself to all the town’s exemplary extremities, especially when you’re not there for very long. At our behest (and according to the route on the map), the bus took us towards Port Lympia and up through the winding hills that offer stunning vistas of pebbled beaches and the azure blue of the Mediterranean Sea. 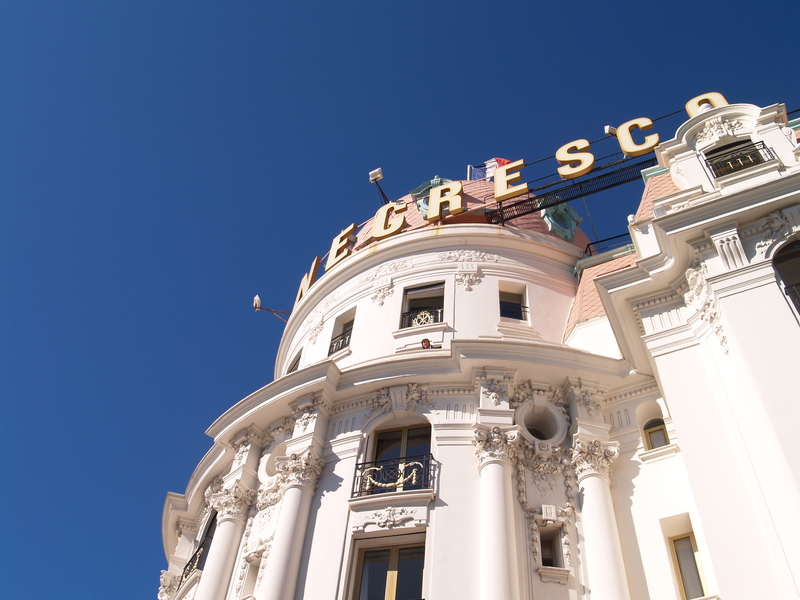 We also passed Le Negresco, a palatial, antiquarian hotel on the Promenade des Anglais, which, if you can’t afford the price of its 5-star rooms or Michelin-starred meals, is thought to be a pleasant spot for an after-dinner tipple. Alas, we didn’t get to sample its sumptuous surroundings, but perhaps one to come back to once I’ve made my millions. We hopped off the bus near the Ascenseur du Château, a brick and mosaic ensconced ascent to Castle Hill which boasts unfathomably scenic views across Old Town and the Port, as well as a surprise waterfall. It was undoubtably one of my favourite parts of the trip, if just for the sheer gorgeousness of the burnt-orange and terracotta tiled roofs, offset by the gleaming blue sea. Post park-wandering, we then re-boarded our bus and travelled onwards to the leafy Cimiez quarter, home to the Musée Matisse. The building itself is reminiscent of an Italian holiday home, described by Lonely Planet as “a red-ochre 17th-century Genoese villa in an olive grove”. Inside contains a wonderfully broad retrospective of French artist Henri Matisse’s work, from oil paintings and drawings to sculptures, tapestries and his deceptively simple, riotously colourfully cut-outs. For art-lovers and collage-admirers, this is a definite must-see. That evening we went for dinner at a recommended Italian restaurant called La Voglia, along an adorable little boulevard called Rue Saint-François de Paule near the Opera House, replete with perfume houses and olive oils shops. En route we strolled along the Promenade just as the sun was setting, which if you don’t do at least once each day, are you really even seeing Nice? 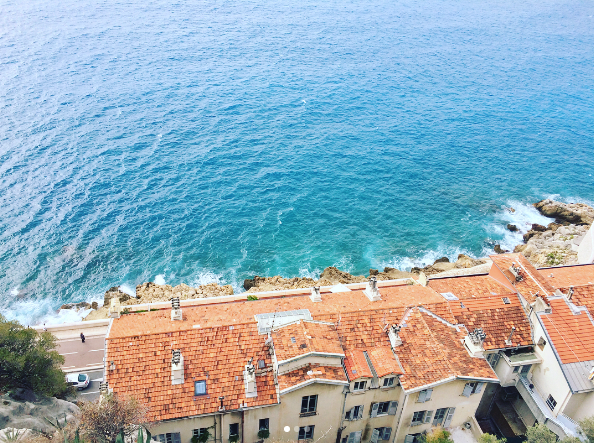 On Monday, we strode purposefully towards Old Town, or Vieux Nice, a sequestered part of the city offering shaded, serpentine alleys, boutiques of leather goods and silken fabrics and delis with mouth-watering delicacies. It was here we tried some fantastically fresh tomates provençale and debated whether they would survive the trip home if we stocked up. (The decision, much to my chagrin, was that they would not). In the centre of the Old Town is the Cours Saleya market, a swarming hive of activity where traders come to sell fresh produce, fish, flowers and more. I was also delighted to discover that on Mondays, it’s home to a gargantuan flea market, where I spent a good few hours rifling through vintage Parisian posters and postcards. It was utter heaven. 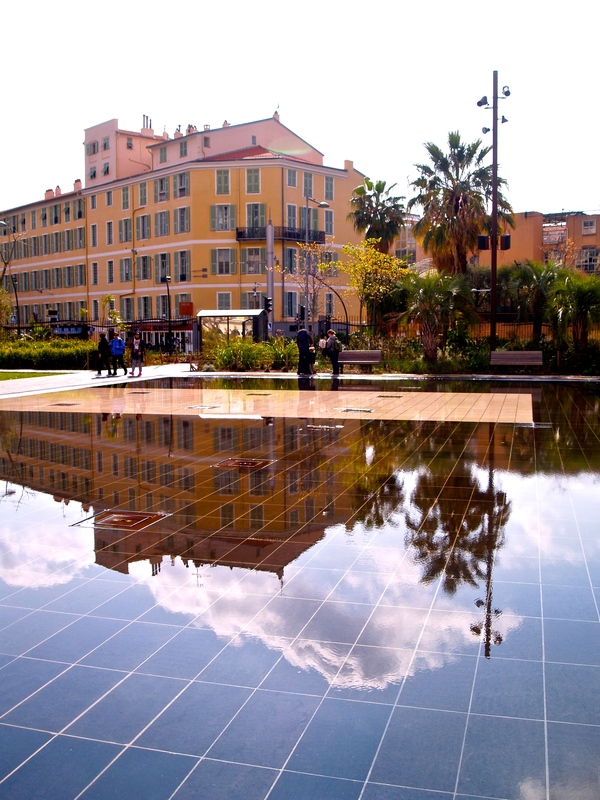 To wrap up our trip, we took a stroll through the Promenade du Paillon, a highly manicured and verdant garden planted with lots of different trees and featuring a gorgeous water mirror in the centre. If you’re looking for a serene way to spend an afternoon after a morning of haggling, then look no further. 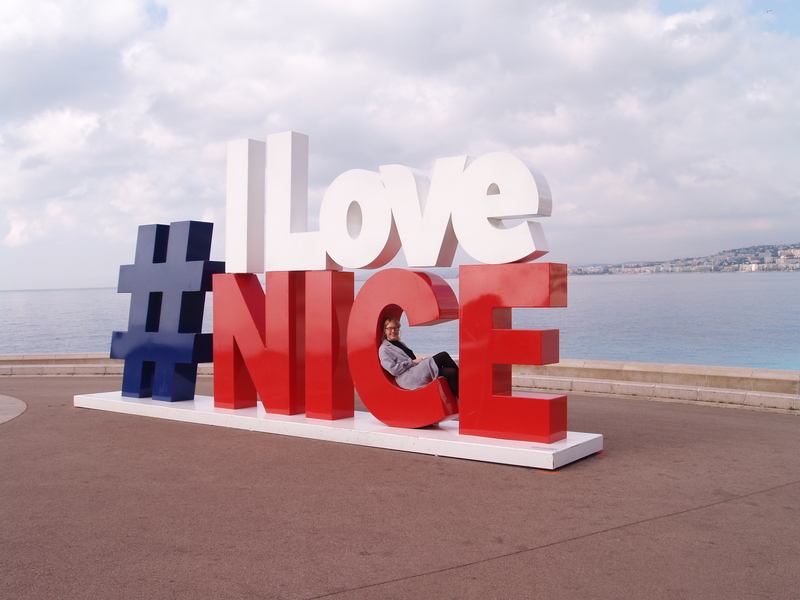 Nice is a brilliant place for a city break. With the breeze and beauty of the ocean on one side, and the historic charm of the old town, its pleasingly peachy architecture, quaint, cobbled streets and lively restaurants on the other, you can’t go wrong. Sure, it has its seedy patches (and there was dog poop everywhere), the beach is devoid of sand and with its well-monied clientele its not exactly cheap as frites. But whack on your rose-tinted sunglasses, and behold the jewel in the Riviera’s crown.